No small controversy has raged about how to define what a cult is or isn't. The word "cult" in its original sense is a broad and generic term used to describe a system of distinctive religious belief and worship. Yet in the past hundred years or so, the word has taken on a very negative meaning and is now used to describe "weird" groups with "weird" practices and beliefs. Yet as some in these groups point out, by referring to the generic term, Christianity and other world religions could be defined as "cults" as well. So how do you describe a problem that doesn't seem to be describable? First of all, defining the problem itself is a major issue. Despite the clear evidence to the contrary that cultic groups are causing untold amounts of social and personal disruption, many among us refuse to admit that a problem even exists, preferring to downplay, avoid or ignore the dire situation. Another problem arises over the controversy that continues over the question of what cults actually are. Among cult watchers whose perspectives range from the theological to the sociological, there has been extensive debate. Many dismiss the notion of cultism completely, citing the old proverb "one man's religion is another man's cult." - or as George Ade, the Aesop of Indiana and most famous son of Kentland said well, "one man's poison ivy is another man's spinach." The age of uncritical tolerance being upon us, no one wants to be seen as being a "hater" and offer something as hateful as an opinion that might be seen as "hating." Others use the term as a fear mongering and divisive label conveniently applicable to anyone their sectarian bias refuses to accept. For the record, we've laid no claim to resolving the issue ourselves: our perspective to come only offers some measured observations about this subject over the years of our involvement in ministry to those affected by "cults." The most serious problem encountered by the man in the street is the amount of misinformation about the cult phenomenon that is gleaned from popular entertainment, sensational news reporting, and common prejudice. These sources have helped to perpetuate many of the myths and misinformation about cults and those who are lured by them. Still another problem arises when politically and economically established cult groups like the Unification Church, the Local Church and the Church of Scientology are successfully attempting to confuse the issue through high-visibility media campaigns aimed at discrediting and harassing the countercult community. They mount up their own shrill action plans complete with feigned outrage over alleged "intolerance" and "slander," intentional and intrusive surveillance of countercult leaders' lives, disruption of websites and meetings, and topped off with litigation aimed at bankrupting those they feel are their enemies. 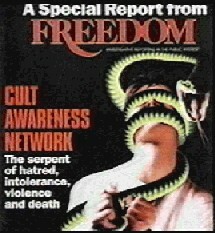 The deliberate assault of litigation by Scientologists helped to bankrupt and destroy the Cult Awareness Network group, at one time the world's leading secular countercult organization. Recent developments in certain European academic circles under the banner of human rights have fostered a "cult cartel" where various cultic organizations now routinely gather to exchange information, support, and "shop talk" on how to counter the efforts of cult awareness initiatives. When many popular figures in today's culture themselves are affiliated with cultic groups lend their voices to protest "religious persecution", the confusion over the problem is magnified tenfold. And an even more complex twist comes when "cultic" groups find themselves under siege by hostile governments in developing and authoritarian Third World countries - such as Falun Gong in Communist China and the Bahai communities of Iran - and press their case (rightfully so) to world bodies such as the United Nations and Amnesty International as faith communities whose civil and human rights are being violated, setting legal precedents for other groups to capitalize upon. As a professor of religious studies who specializes in research, writing, and teaching about America's alternative religions, I can tell all of you that the word "cult" has become an essentially contested concept. That is, like many other words, there is no universally agreed-upon meaning. Before one can know what the term means one must know the user and his or her context religiously and socially. I tell my students there are four major approaches to using the term: journalistic (tends to be sensational), theological (defines "cult" by some standard of orthodox truth), sociological (uses "cult" to describe groups that self-consciously oppose the mainstream of culture), and psychological (uses a standard of psychological manipulation and coercion). What counts as a cult differs by these varying definition. All three may agree on a certain group being a "cult" such as Jim Jones' "Peoples' Temple." But a theologian might label the LDS church a "cult" simply because it diverges considerably from standard orthodox Christianity, while a sociologist would say it isn't a cult due to its size and influence. So maybe it would be best to stop arguing about what is a "cult" until you make clear your own orientation--that is, approach to defining the term. The professor helps to cut through the confusion on the issue of the label "cult" by clearly identifying three of the most widely known perspectives that we agree should be used by which to help bring some clarity to the dialogue. We can spend much time arguing over the relative merits over one's differing views on what "cults" are but for the purposes of our work here on the Spiritwatch site, we take the following position on cults, following the input of the above perspectives. From an orthodox Christian perspective, a cult is a group of people who follow one man or the group's spiritual teachings and practices that, when compared with orthodox Christian doctrine always contradict them, as well as exalt the group's own unique religious perspective as the only way to truly serve God. From a purely Biblical perspective, 2 Corinthians 11:4 gives us the clearest and most concise description of how cults may be discerned. False teachings, the apostle Paul warned here, will introduce three major errors to the unsuspecting in the name of Christianity. First they will preach their own determination of who Jesus Christ is, denying his Biblically revealed identity as God the Son and exchanging it with another. They'll point to "another Jesus." Secondly, cult teachers will proclaim a "gospel message" that is ultimately is a message of works-centered salvation, in sharpest contrast to the Good News of saving grace through faith in Christ (Ephesians 2:8-9). They'll preach "another gospel." Thirdly, the revealed spiritual nature of the work of the cult claims to be, but actually is not, inspired by God the Spirit. Instead, a chilling reference is made to spiritual entities who lend tremendous spiritual power to their natural human puppets to preach deceptive gospels. They'll be empowered by "another spirit." This is the work of demonic agents in allegiance with Satan, the opposer of God throughout history.In short, a cult will energetically claim to follow the Bible and be the only group to be found anywhere who really are interpreting it correctly (hence the rationale for some countercult workers calling some groups "Bible based"). Ultimately, once examined, a questionable group's doctrines will always deny an orthodox Biblical truth in one way, shape or form and yet retain a powerful veneer of orthodoxy, purity and rationality to complete it's masquerade. "(A cult is) .. a group that uses methods that deprive individuals of their ability to make a free choice. They use deceitful recruitment techniques, they deceptively and destructively use the devotees' energies, and they capture the devotee's minds .. to advance the goals of the group leaders to the actual or possible detriment of members, their families, or the community. .. Cults can include groups and organizations that are not typically viewed as cults". The coercive and psychologically abusive nature of a high-demand group which achieves its successes at the cost of the individuality and freedom of thought of members certainly is a terrible reality that is most easily observable in these cultic communities. Unfortunately, Dr. Martin's last observation in the citation above has been largely overlooked. Throughout much of the media coverage of the Heaven's Gate suicides, the imagery and mystique that surrounded the deceptive work of cult leaders such as David Koresh and his Branch Davidians and Jim Jones' People's Temple movement was constantly invoked. We saw video and film of these two groups and commentary that warned us of charismatic leaders, elitist teachings and close-knit groups at violent odds with the world. The message was undeniable: cults are fringe groups whose paranoid leadership and counter-cultural lifestyle clearly sets them off from the rest of society, thus enabling easy identification. Regrettably, this is often not the case. Cultic deception today no longer confines itself to wearing orange robes or dwelling in rural compounds alone: it embraces respectability and personifies responsibility with a passion that is truly astonishing to behold. Cultic groups own massive real estate holdings, run newspapers, wield great influence on public policy, and establish charitable medical associations. They pay their bills on time, and keep great lawns and well-kept houses of worship. 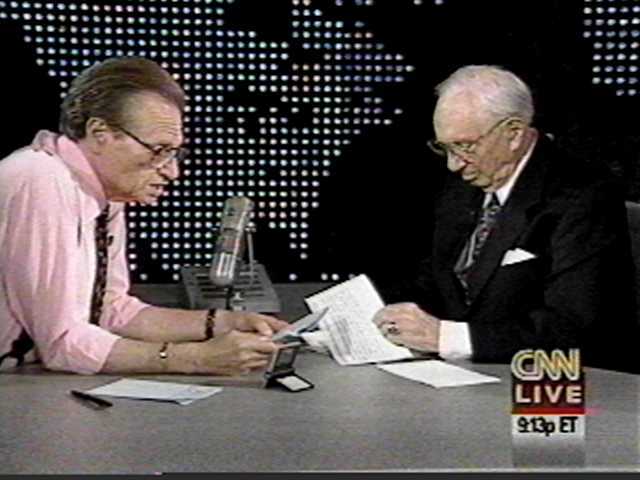 Their leaders and the stellar ideals they espouse are upheld routinely can be found on talk shows (such as Larry King's hosting of LDS President Gordon Hinckley a few years ago on his CNN broadcast), best seller lists, and at power lunches from Hollywood to Washington. They appear to live their lives in such a blameless manner that to point out that they are "cultists" usually brings forth a storm of protests and accusations of intolerance, bigotry and fomenting of hatred. This societal perception of mainstream status of cult groups has given them tremendous amounts of freedom to continue their subtle and profoundly destructive operation without any serious consideration of the problems that they have posed to society at large. This observation would draw a certain amount of support from the sociological perspective to some degree at least. Yet despite the differences of opinion among them, many within the countercult community have come to a solid consensus on the essential issues and have come to grips with the cult problem today. Steve Hassan and Dr. Martin are two of the most well known contemporary authorities on the cult problem. Both are internationally known experts in their field and have actively been assisting victims of cultic abuse, as well as educating the public at large about dangerous cult groups. And while both have differences in their perspectives on cultism, both are in much agreement on their description and analysis of the problem. Their insights which we will now share are drawn from Martin's excellent book and Hassan's most well known work entitled Combatting Cult Mind Control. Cults are organizations that freely use unethical and deceptive techniques to recruit and control members. Cult groups do not depend solely upon theological and spiritual persuasion to attract converts. Destructive cult groups also utilize sophisticated techniques of actual and literal mind control to deliberately manipulate prospects and new converts. Cults can and do include groups and organizations that are not typically viewed as cult groups, in the sense that religious overtones do not necessarily have to be present among group members.